While fluoro-deoxy-glucose (FDG) has emerged as an important radiotracer for imaging tumors, myocardial viability and infection, the role of other glucose analogues should also be explored. Tc-99m Glucoheptonate (GHA) has been used for imaging brain tumors and lung tumors. The uptake mechanism may be linked to GLUT-1 (Glucose transporter) and GLUT-4 expression similar to FDG. GHA is easily available and cheap. With the availability of single photon emission computed tomography/computed tomography (SPECT/CT), GHA imaging should be re-explored as a tumor agent and also for imaging myocardial viability. Aim: To determine whether F-18-fluorodeoxyglucose positron emission tomography (F-18-FDG PET) can be used to differentiate among common enhancing brain tumors such as gliomas, metastatic brain tumors, and lymphoma. Materials and Methods: We evaluated 20 patients with an enhancing brain tumor on magnetic resonance imaging (MRI). FDG PET scan was done in all patients pre operatively. For PET image analysis, regions of interest were placed over the tumor (T), contralateral cortex (C), and white matter (WM). Average and maximum pixel values were determined at each site. On the basis of these measurements, average and maximum standard uptake values (SUV avg and SUV max ) were calculated, and comparisons among lesions were then made. Results: SUV avg and SUV max are significantly higher for central nervous system (CNS) lymphoma than for other tumors ( P < 0.01). 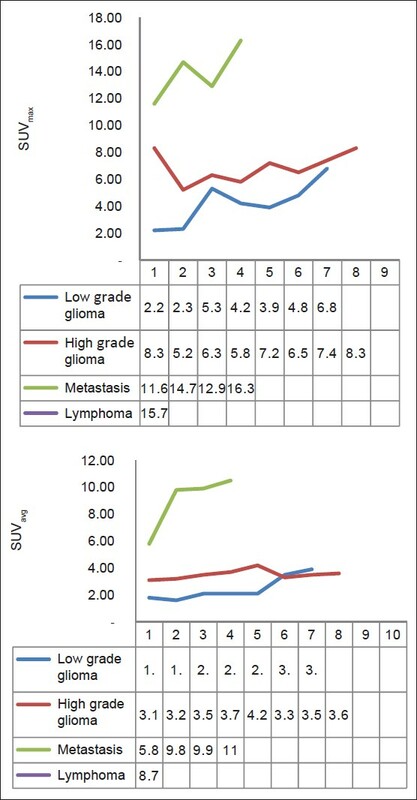 High-grade gliomas showed significantly higher SUV avg and SUV max than the low grade gliomas ( P < 0.05) and metastatic tumor showed higher SUV avg and SUV max than all gliomas, both low and high grade ( P < 0.05). When the lowest values of CNS lymphoma parameter were used as cutoff levels to distinguish CNS lymphomas from other tumors (i.e. 100% sensitivity), SUV max was the most accurate parameter. Using a SUV max of 15.0 as a cutoff for diagnosing CNS lymphoma, only one case of metastasis (SUV max , 16.3) was found to be false positive in this study. Conclusion: FDG PET appears to provide additional information for differentiating common enhancing malignant brain tumors, namely lymphoma versus high grade glioma and metastatic tumor, particularly when differential diagnoses are difficult to narrow using MRI alone. Tc-99m dimercaptosuccinic acid (DMSA) is filtered through the glomeruli and reabsorbed by the proximal tubules as low molecular weight proteins. In Lowe syndrome this mechanism is impaired and so poor DMSA uptake is seen. Poor DMSA uptake was shown in very few studies, but none mentioned normal Tc-99m MAG3 uptake. In this case, the patient had poor DMSA uptake, normal MAG3 uptake and a neurogenic bladder in anterior to the left kidney that attenuates left kidney. 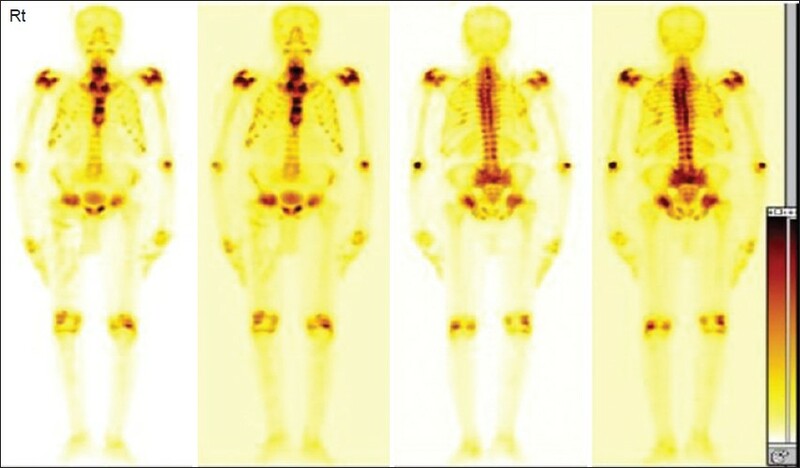 Oncogenic osteomalacia is a rare metabolic bone disease characterized by phosphaturia and hypophosphatemia. Certain tumors secrete a phosphaturic factor, which results in this metabolic abnormality; this factor called as phosphatonin, is in fact a fibroblast growth factor 23 (FGF-23) involved closely in phosphate homeostasis and skeletogenesis. Complete excision of these tumors facilitates reversal of the problem. We have reported here the case of a patient who was crippled with this disease and on thorough investigation revealed an oncogenic osteomalacia with tumor focus in the right tibia. The tumor was identified as a mesenchymal tumor, i.e., hemangiopericytoma. Tumor excision alleviated patient symptoms with rapid symptomatic and biochemical improvement. Ectopic thyroid tissue is an uncommon congenital aberration. It is extremely rare to have three ectopic foci at three different sites. 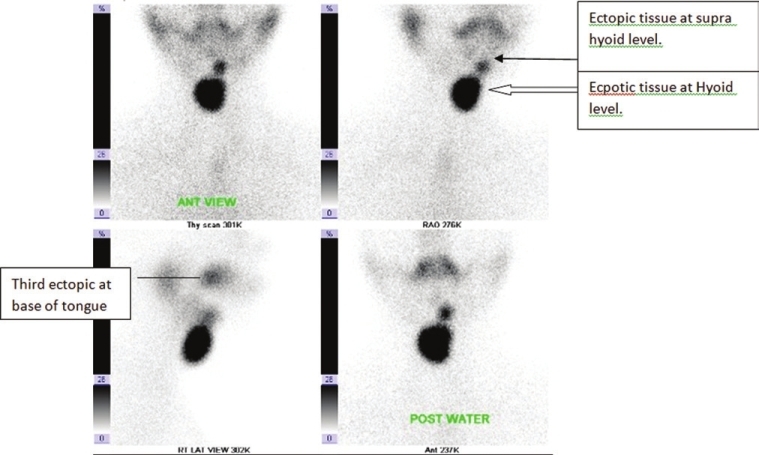 The thyroid scan has been used successfully to diagnose ectopic thyroid tissue. We report a case of ectopic thyroid tissue at base of tongue, another at the level of hyoid and third one as aberrant tissue at suprahyoid location in a 16 year old female who presented with swelling in front of neck. This patient was clinically diagnosed as thyroglossal cyst and was being planned for surgery. Preoperative thyroid scan helped in establishing diagnosis of ectopic thyroid which was the only functioning thyroid tissue. Thus, it prevented unnecessary surgery. Therefore it is suggested that thyroid scan and USG/CT scan must be done as routine work up in neck swellings pre operatively to avoid unnecessary surgeries. 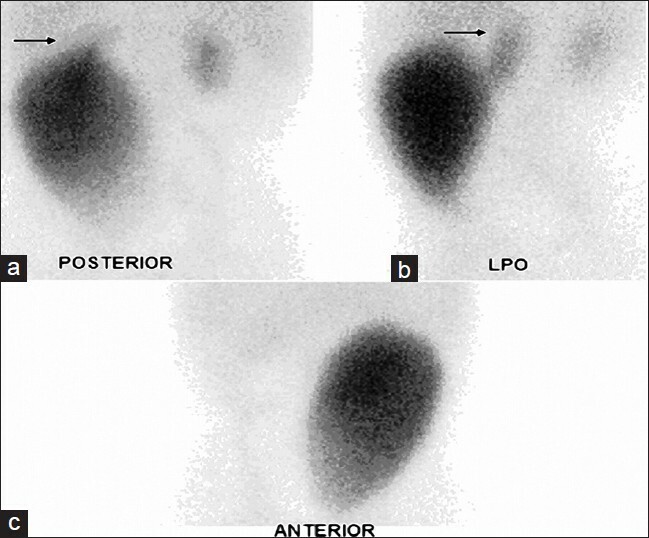 Lymphoscintigraphy is a useful technique for the evaluation of lymphatic function in the presence of limb swelling. 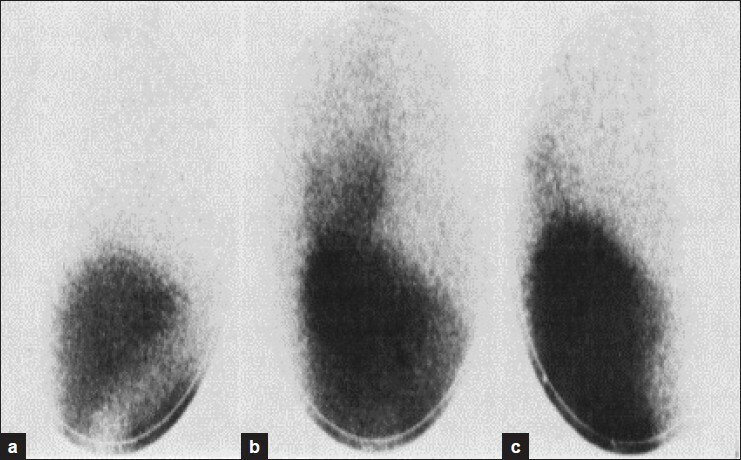 The authors report a case where genital swelling in a 20-year-old man was investigated by lymphoscintigraphy. We performed lower limb lymphoscintigraphy and scrotal lymphoscintigraphy in the patient on two different days. Lower limb revealed dermal backflow pattern in lower limbs, inguinoscrotal reflux of the lymph and unexpected avid radiotracer uptake in the axillae bilaterally. 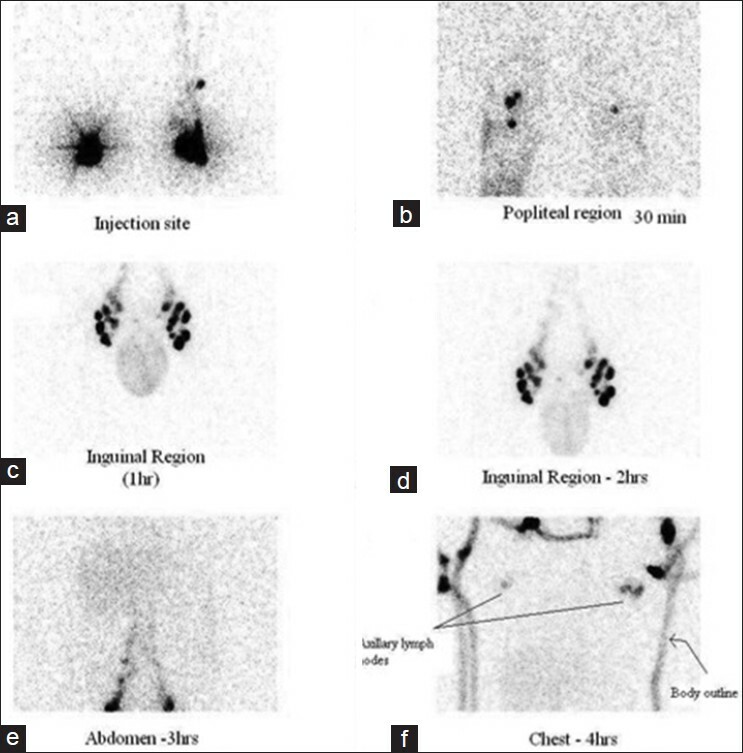 Scrotal lymphoscintigraphy revealed slow movement of the lymph from the scrotal skin and again unexpected avid radiotracer uptake in the axillae bilaterally. 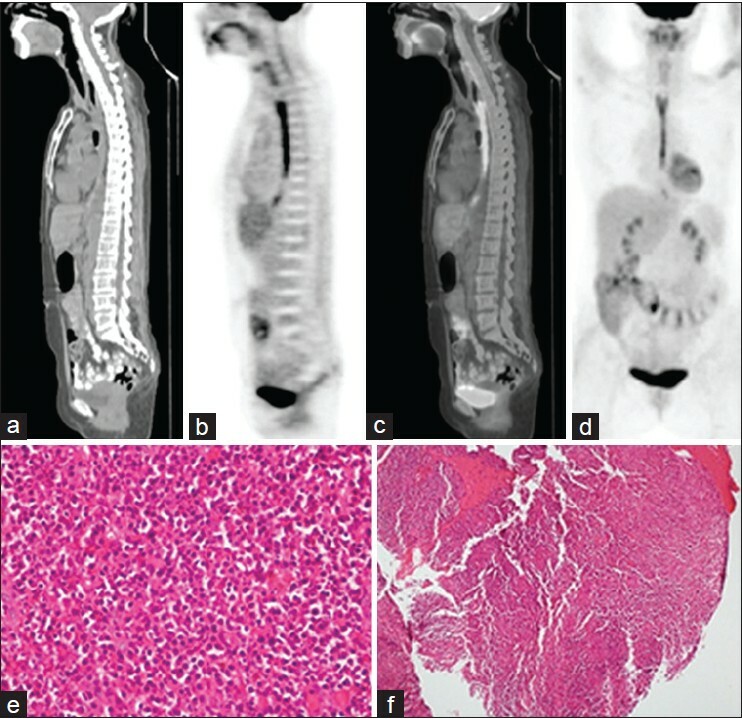 Findings were concluded as congenital hypoplasia of lymphatics in lower limbs, congenital lymphectasia/compensatory megalymphatics in scrotum and aberrant lymphatic pathway, possibly due to malfunctioning/nonfunctioning thoracic duct. 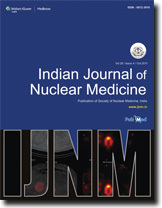 Nuclear medicine techniques like 99m Tc-Leukoscan and 67 Ga-citrate scan have been used in localizing infectious pathologies in renal transplant patients. We present an interesting case of febrile renal transplant with discordant findings of tracer uptake in the transplant kidney on 99m Tc-Leukoscan and 67 Ga-citrate scan. Lymphatic drainage outside the ipsilateral axilla in breast cancer is discovered in as many as 25% of all sentinel lymph node procedures and it is evidenced by lymphoscintigraphy. Contralateral axillary drainage is a rare clinical situation, mostly if there is not prior breast surgery, but this situation is extremely exceptional if we also found internal mammary chain drainage. We have not found such a case published in literature. This atypical finding is source of doubts because it could have clinical implications in the management of patients. 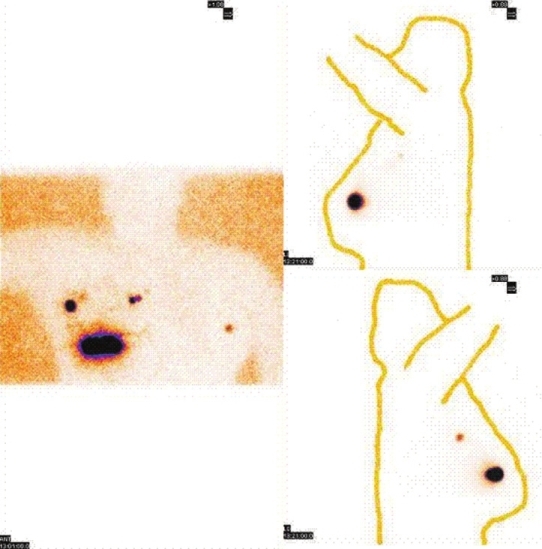 We present a woman just diagnosed of breast carcinoma with hot nodes in bilateral axillary and ipsilateral internal mammary chain lymph nodes, shown by preoperative lymphoscintigraphy. We review published cases with contralateral axillary drainage, which enhance the role of scintigraphic procedure in such cases and show induced controversies in selecting the most adequate management. 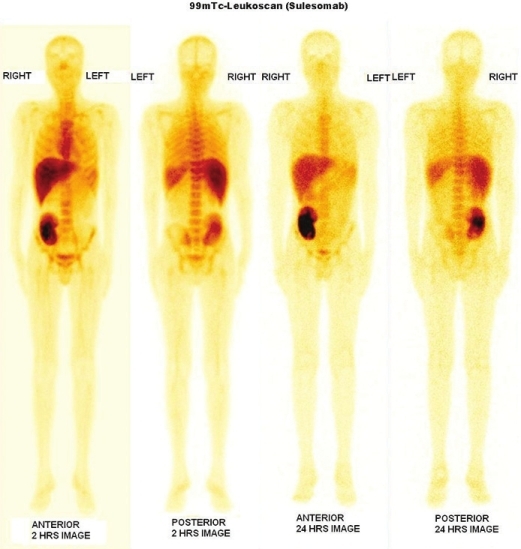 A 45-year-old female diagnosed with carcinoma of the left breast on histopathological examination underwent both 18 F-flourodeoxyglucose (FDG) and 11C-methionine (MET) positron emission tomography/computed tomography (PET/CT) as part of a protocol comparing the utility of these tracers for predicting a response to neoadjuvant chemotherapy in breast carcinoma. Abnormal FDG and MET accumulation was noted in the left breast primary, left axillary lymph nodes, and also in a well-defined nodule present in the left lobe of the thyroid gland. 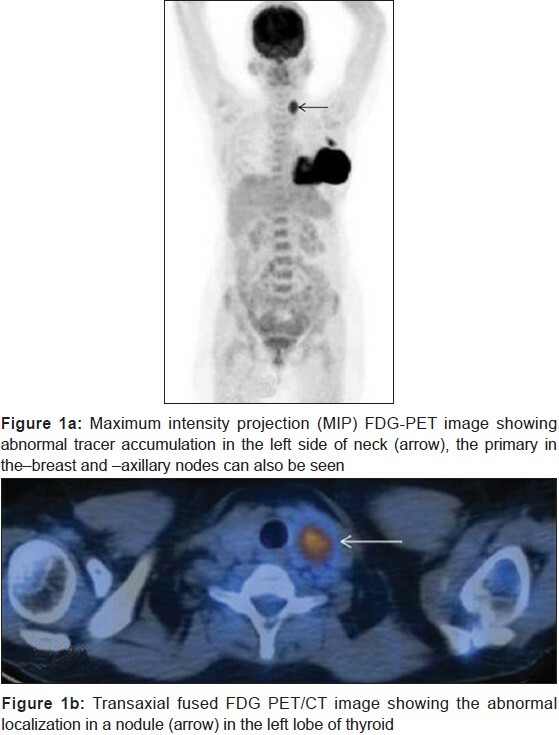 Keeping in mind the possibility of thyroid neoplasm/metastasis, the patient was referred for fine needle aspiration cytology (FNAC) from the thyroid nodule that revealed features of a simple colloid nodule. 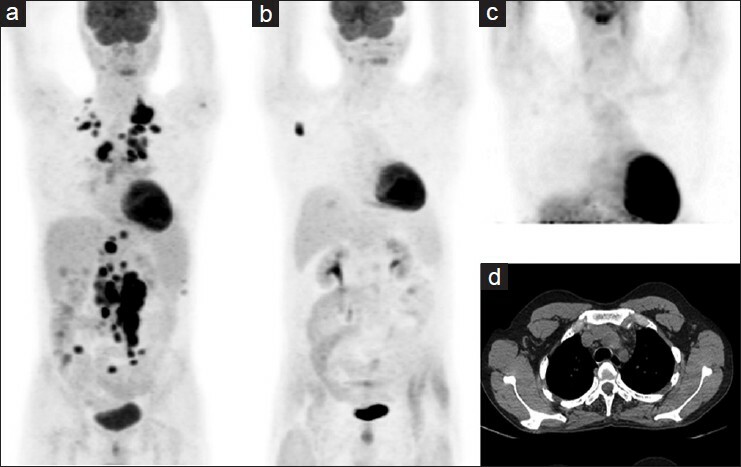 Focal thyroid lesions incidentally found on 18 F-FDG PET/CT have a high risk of thyroid malignancy. Non-specific accumulation of FDG in thyroid adenomas is also known. 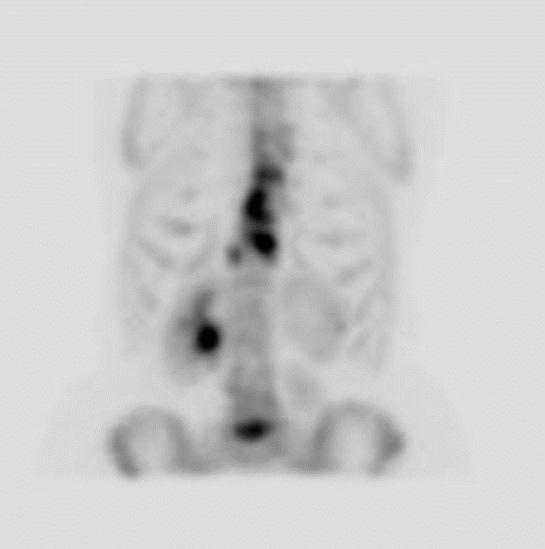 This case highlights a potential cause for false positive on C-11 MET PET/CT in colloid adenomas, which should be kept in mind while using this tracer for oncological indications.